The devotion of the first Saturdays consists in four acts: Confession, Communion, five decades of the Rosary, and fifteen minutes of meditation on the mysteries of the Rosary. On February 15, 1926, Sr. Lucia was visited by the Child Jesus who greatly encouraged the Five First Saturdays devotion. However, Sr. Lucia explained that many find it very difficult to confess on the first Saturday, and so asked whether it would be permissible for these to confess within at least eight days of the first Saturday. It is clear that confession need not be made on the very first Saturday itself, nor even (necessarily) within a week – but rather, it is to be made sometime around the first Saturday. This could easily be understood to extend to ten or perhaps even twenty days on either side of the first Saturdays. Surely, however, it is better to confess closer to the first Saturday itself (or at least within the eight days before or after), when possible. We are to receive Holy Communion with the intention of making reparation to the Immaculate Heart of Mary. Further, Communion may be received either the Friday before or (as is more likely) the Sunday following, if it is difficult or impossible to receive Communion on the Saturday itself. 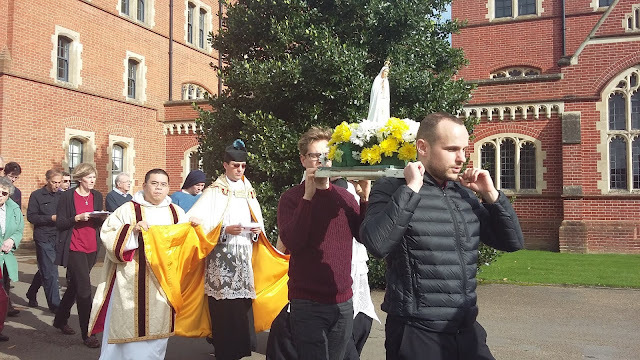 Further, the Saturday Mass need not be a specific Mass for the Saturday Devotion – whether a Funeral Mass, a Wedding Mass, or even a Vigil Mass for the coming Sunday, any Mass at all will suffice. This is to be granted by the dispensation of the local priest, generally Communion on the Saturday itself is to be preferred (but, we re-iterate, this is not an absolute). Finally, if an individual is unable to attend Mass (due to some serious reason), even Communion outside of Mass will satisfy for the First Saturday Devotion, with the dispensation of the individual’s priest. It is required that we pray five decades of the Rosary with devotion [apologies for a typo earlier which said fifteen decades]. This must be done on the First Saturday itself. However, to be sure, even the greatest saints struggled with distractions in prayer – and St. Louis Marie de Montfort, the “Apostle of the Rosary,” says that this is the most difficult of all prayers. Therefore, we need not become scrupulous or excessively troubled if our Rosary is not perfect. Rather, we strive to make our Rosary a true and worthy expression of love – avoiding distractions as much as possible, but also recognizing that such is the human condition. St. Teresa of Avila gives consoling words regarding distractions in prayer (see the Fourth Mansions of the Interior Castle). Lastly, we are to meditate on the mysteries of the Rosary for an additional fifteen minutes. This could be the devout recitation of another portion of the Rosary, or meditative reading of Scripture which pertains to some of the mysteries of the Rosary, or any other of a number of different forms of prayer. What is most important is that we set aside this additional time for meditation on the mysteries. It will generally be better to chose one or two mysteries to consider – though, technically, we could meditate on any number of them. Together with our Lady, we consider the love of God made manifest in the mysteries of our Savior’s life, death, and resurrection. Put simply, the following acts of the Five First Saturdays Devotion are to be completed on the first Saturday of five consecutive months: Confession (about eight days before or after), Communion (between Friday and Sunday, preferably on the Saturday itself), the Rosary (five decades), and an additional fifteen minutes of meditation on one or more of the mysteries of the Rosary. Our Lady does not promise that all who make the Five First Saturdays Devotion will go to heaven, but rather that they will have all the graces necessary for salvation provided to them at the hour of death. This is a great promise indeed, and at the same time calls to mind that we must co-operate with God’s grace. We recall what St. Alphonsus regularly emphasized: The grace of final perseverance is not to be considered alone and separate, but rather is rightly thought of as the final grace in a long line of graces throughout many years of life by which God leads a man to salvation. The grace of practicing the First Saturday devotions is then seen as an important link in this chain of graces which, God willing, culminates for each of us in final perseverance unto eternal life. Further, our Lord promises that he will bring salvation to many other souls through our practice of this devotion, and also peace to the world. Our Lady of Fatima, Pray for us! Help us to pray the Rosary daily!